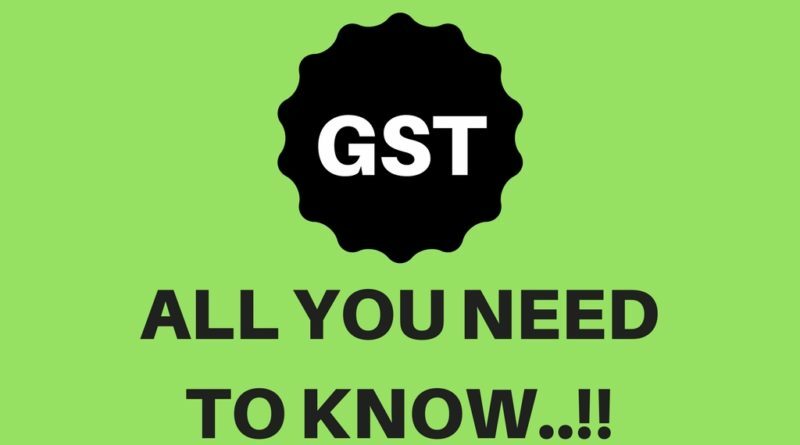 What is GST (GOODS AND SERVICES TAX).? GST is abbreviated as Goods and Services Tax. GST is all set to be implemented from July 1st of 2017 in world’s largest democratic country India. Narendra Modi led BJP Government is all set to launch GST to change the tax structure of the India and all the states in the country accepted with the central government to implement GST. In GST regime, the Tax stops only after the product reached the customer. It can be called as a “DESTINATION BASED CONSUMPTION TAX”. GST is considered as large, historic and path-breaking reform in Indirect Taxes in India. GST is made eliminating the disadvantages of indirect taxes to people, businesses, and government. The main aim of the GST is to eliminate the cascading effect of taxes. GST is perceived as a way to eliminate tax evasion. GST is more relied on Information Technology(IT) for the implementation. Input Tax Credit plays an important role in the GST. GST rates are fixed to stop inflation and to reduce the burden on Consumer Price Index (CPI).The following are the various rates given by GST Council for different types of items. GST COUNCIL is the directing authority of the GST. The decisions regarding GST should be passed in GST Council with a 3/4th voting majority. Union Finance (Central Government) has 1/3rd weightage and all the states together have 2/3rd weightage in decision making regarding the passing of resolutions. It is defined as “Cooperative Counsellism”. CGST Law is passed by the Central Government and all states have passed the SGST laws in their respected states. Below 75 lakhs of turnover. No Input Tax Credit is given to composition dealers. Only one return should be filed every quarter. Input Tax Credit is given to Non-Composition dealers. All tax rates apply as per tax slabs given by GST law. Should file returns every month up to 4 returns. Reverse Charge is the concept of tax collection where the recipients of the goods will pay tax, unlike the seller. The Reverse Charge traders should be registered with GOVT. The Reverse Charge paid can be earned back in the form of Input Credit. Another important thing in Reverse Charge is if the registered dealer is purchasing from the unregistered dealer, the registered dealer should pay GST if the amount exceeds 5000 rupees per day. If transport is used for doing business, the businessman has to pay the reverse charge, the transport owner doesn’t need to pay tax. Example: In case of Tobacco Leaves, the tax rate is 5%. Here farmer doesn’t pay tax, the buyer will pay tax to the government. The GST registration is done through GSTN (GST NETWORK). It is a private company which is controlled by the government. It provides most of the IT services for GST.GST payments and return filings are handled only through GSTN.The tax payments are made generating the challan in GSTN. The tax less than 10,000 rupees can be paid in cash and online and the tax more than 10,000 must be paid through online only. The registration for GST is done by integrating the PAN number. The GSTIN (GOODS AND SERVICES TAX IDENTIFICATION NUMBER) is allocated to every dealer. The GST registration is completed within 3 days and if not completed and no queries raised from the GST authority, we have to consider it as a Deemed Registration. For one business one GSTIN (GOODS AND SERVICES TAX IDENTIFICATION NUMBER) is enough and the owner can take as many as GSTIN numbers as per the verticals of business if wanted. The businesses of GST exempted goods and services don’t need to register. The Individuals having more than 20 lakhs turnover should register for GST and NO fee is collected for registration. The E-Commerce businesses should be registered compulsorily irrespective of the turnover limit and must pay tax in advance. The following taxes are removed and in the place of them GST is implemented. Entry Tax, Octroi, Local body tax. Excise on medicinal and toiletries preparation. The taxes which are given below are going to be collected even after the GST is implemented. Helps in eliminating Tax Evasion. Results in decreased human interaction between people and tax authority. Helps in attracting more investments. Results in more competency in the business sector. Results in uniform tax rates across the country. Wheat, Rice, Maida, Atta, Dals, Poultry Feed, Aquatic Feed, Books, Milk, Vegetables, Salt, Jaggery, Fish, Meat, etc are exempted from GST but If sold in branded, packed and frozen state, GST have to be paid.